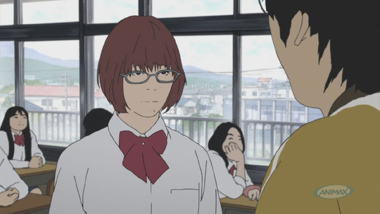 For all the anime series that take place in a middle or high school, very few of them are actually about school-aged teens in a meaningful way. 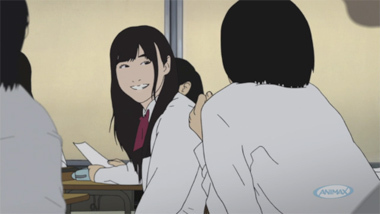 Often that’s intentional; the sparkling clean school buildings of TV anime, filled with bubbly students in crisp, starched uniforms, serve as a pleasant backdrop for any number of fantastic stories, without having to dwell on the tremendous awkwardness that generally comes with being an adolescent. 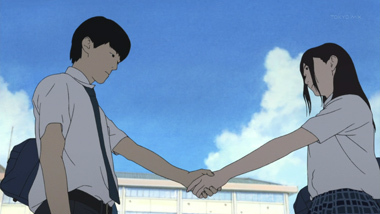 In contrast, Flowers of Evil—an anime that can remind you of actually being in school more than you’d like—is all about that special kind of awkwardness unique to individuals straddling that gray area between child and adult. 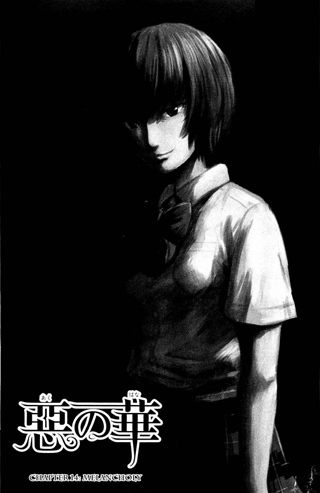 Kasuga, our pre-teen protagonist who perches on that razor’s edge between self-loathing and self-worship common to his age, pines after Saeki, the most popular girl in his class. 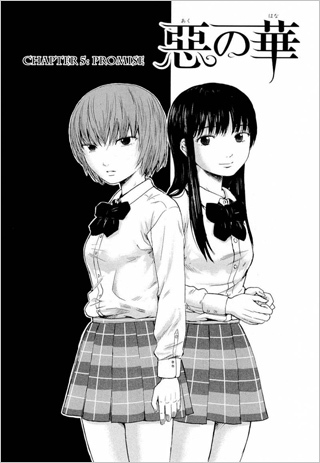 Nakamura, a delinquent-in-training who scares her classmates by giving them death glares and curses out teachers, becomes aware of Kasuga’s innocent crush on Saeki and decides to have some fun meddling with the two of them. 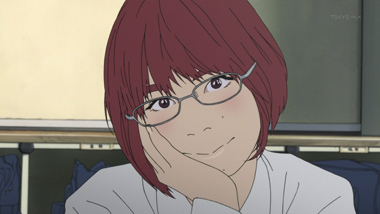 But is Kasuga’s crush really innocent to begin with- or rather, is there such thing as an innocent crush? Is Nakamura a sadistic monster, or is she just being honest about the feelings everyone else lies about? 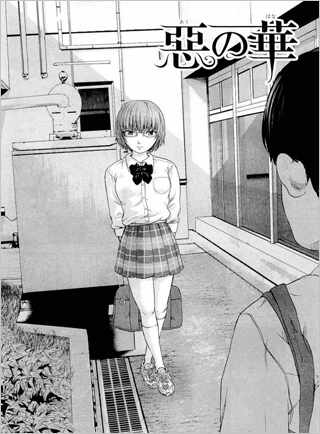 And who is Saeki, if she’s not the girl Kasuga is putting on a pedestal in his imagination? 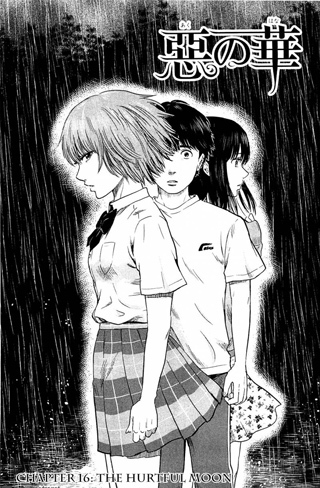 To call the relationship between these three a love triangle seems like a disservice, but in many respects the story of Flowers of Evil is a love triangle—a bizarre, unsettling, unpredictable love triangle that provokes interesting questions. Trying to figure out what Kasuga’s obsession with Baudelaire, the 19th Century novelist who penned the titular poetry collection, Flowers of Evil, has to do with anything adds another dimension to the trio’s drama. For those looking for a show with some serious psychological heft, you can’t do much better than Flowers of Evil, but dwelling on awkwardness and darkness unsurprisingly makes for a rather awkward, dark experience. In fact, Flowers of Evil can be almost aggressively unpleasant at times. 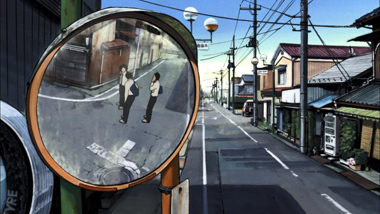 The show first made waves among anime fans for its animation style, which used real actors extensively as models for the animation. 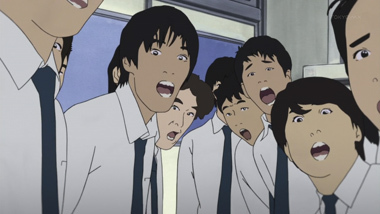 This technique, called rotoscoping, results in characters who look more like real people than in virtually any other anime ever made, but that means they have real flaws. Instead of glittering gem-colored eyes and slender limbs, the pre-teen characters in Flowers of Evil have stocky bodies, moles and unsightly hair. 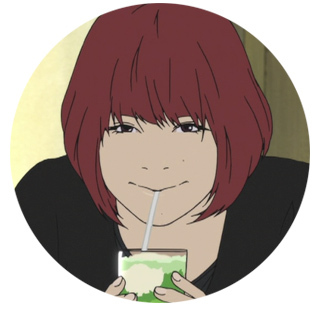 If you watch a lot of anime, being suddenly confronted with such realistic, and at times, downright ugly characters can feel like a slap in the face- but of course, that’s kind of the point. And it’s not just the characters that got hit with the scary end of the realism stick; the environments aren’t pretty either. 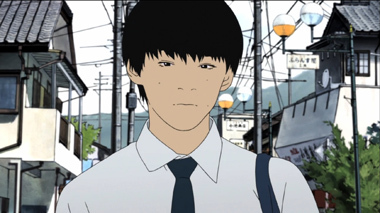 The town that Kasuga and his schoolmates inhabit is a dull, dank place. It’s hard to tell if the place is actually run-down and decrepit, or if it just looks that way compared to the idealized scenery in most anime. All that said, the visuals aren’t without charm; sometimes, especially later in the series, we thought the realistic characters allowed for some impressively nuanced facial expressions and gestures. “Nuanced” is probably a good word to sum up Flowers and Evil in general, so whether you love the unusual art style or hate it, it’s a pretty good match for the source material. In fact, the whole series will probably be love-it-or-hate-it material for many viewers. Depending on how you look at it, the pacing is either glacially slow, or uniquely satisfying. The first episode is a study in gradually mounting tension, to the point where the anticipation for something to happen becomes almost palpable, something you can feel in your fingers and toes as you watch the slow burn on screen. We found the show’s high water marks- those moments where the tension breaks and the slow burn suddenly erupts into a forest fire- more than worth the price of admission. However, we have to admit those moments were few and far between. As good as this show is, we have to admit that not a whole lot happens in it. Furthermore, while a lot of the show’s perceived flaws can justified as stylistic choices, some of them are just downright flaws, even for those of us who were big fans of the show’s artistic direction in general. Sometimes instead of masterfully building tension, the show is just plain slow, dragging out mundane events seemingly to save money on animation more than anything else. Also, the show’s technique of revealing a snippet from the episode to come during the opening animation is interesting at the beginning, but towards the end of the show’s 13 episode run, it actually spoils some of its best moments before the episode has even properly started. Finally, while we liked the overall story progression, the ending left us underwhelmed—it seemed more like a cry of “cross your fingers for a second season!” than a proper resolution to anything. Still, warts and moles and slow pacing and all, we’re hoping against hope that there’s more Flowers of Evil on the horizon. Fans often say they’re craving something different from typical anime fare, and different is certainly what you get with this show. 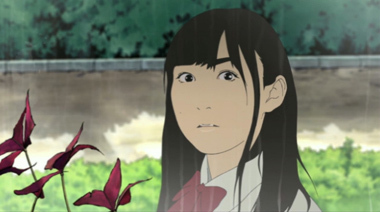 But, as Kasuga learns very quickly, sometimes there’s nothing quite as dangerous as getting what you want. Below: Scenes from Flowers of Evil . 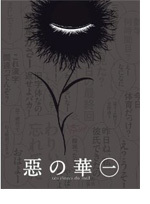 Below: Manga illustrations for Flowers of Evil .